We need your help! 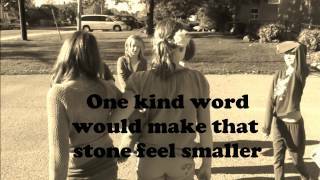 We are crowd-sourcing a video for our anti-bullying song "It Just Takes One." We plan to release the video to coincide with Bullying Awareness Week this November. Each week, we will post a request on our Facebook page to give you an idea of what sorts of images we are looking for --- you can send us your drawings, cartoons, photos and videos to tootalltunes@hotmail.com -- we might include it in the video! Listen to the song on our Bandcamp page, check out the lyrics, and get inspired. We can't wait to see how it all comes together. Let's stand tall together against bullying and encourage kids to be helpful bystanders! Sept. 4/13 -- Assignment #3 -- What does it look like to "stand up tall...Be like a tree"? We're looking for your ideas on how people can act brave and tall. Sept. 12/13 -- Assignment #4 -- We need photos of people holding up a sign that says "Be the One" or "I will be the one" -- or how about a video of your child saying the phrase out loud? Sept. 18/13 -- Assignment #5 -- "Todd was just a guy, a little different from the others, they all teased him, and called him a fool." Bullies pick on others for any small difference -- what makes you different or special? Send us a photo, drawing or video of how you are unique! This short video was made using Flip Boom animation software and is really easy to use. Sept. 25/13 -- Assignment #6 -- One of the most powerful things you can do as a helpful bystander is to simply stand beside the person who needs help. This week for Project Pebble we are looking for images of friends standing tall together! Oct. 2/13 -- Assignment #7 -- Today we are looking for "kind words." Help us make a list! Send us a photo of someone holding a sign with a kind word (or more) on it. What is "one kind word (that) makes us all feel stronger?"